Chichester’s newest middle-distance star, Rebecca Moore, has been rewarded for her fine recent form – and especially her brilliant run in the Great South Run in October. The 25-year-old has been included in the England team to compete in Bermuda in mid-January and will compete in a six-strong squad either at 10k or half-marathon distance. 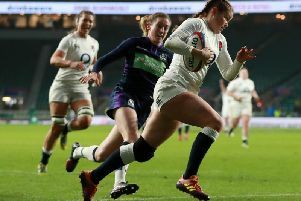 This is the second time Moore has caught the England selectors’ attention following her invitation to compete in Dublin earlier in the year. The three men and three women for Bermuda include two national champions. The women are headed by Gemma Steel, who competes for Charnwood and is ranked third in the UK all-time rankings over 10k with a time of 31.26 beaten only by two icons of the sport, Liz McColgan and Paula Radcliffe. Steel ran a fine 55.18 at Portsmouth over ten miles and will be joined by Jenny Spink from Bristol, who finished just one second and one place in front of Moore in 56.30 – ranking the trio in the top seven UK runners for 2106 over the distance. There is local interest in the three-strong men’s team with Alex Teuton from the City of Portsmouth club selected alongside Scott Overall from Blackheath & Bromley and Matthew Sharp from Enfield & Haringey. Again the selectors have taken note of the Great South form where Sharp finished a fine third behind Olympic stars Chris Thompson and Andy Vernon in a fast 48.18. Overall and Teuton, sixth and seventh in the race, both broke the coveted 50-minute barrier. The pair also have strong Chichester connections with Overall third in the 2016 Chichester 10k and Teuton a regular competitor in the Chichester Corporate Challenge, both as a junior and senior. Deciding to miss the Gosport Half Marathon this year, James Baker instead took to the Surrey Hills on Sunday to compete on his favourite off-road surface in the Three Moles race near Dorking. Covering nearly 15 miles, the three-lap course included an ascent up to Box Hill on each circuit including one challenging section ascending 270 steps. The Chichester runner was the only athlete in the field of 170 to break the 90-minute barrier and won by a minute in 1.29.12 to extend his run of victories over the half-marathon distance and beyond. Meanwhile, Baker’s training partner for much of 2016, American doctor Chris Zablocki, returned to Spain over the weekend to compete in the Valencia Marathon. In a quality field where the first three finishers, all Africans, broke the 2hr 9min barrier, Zablocki was just outside his time of last year and had to be content with a time of 2.18, still one of the fastest times recorded by any athlete with a Sussex connection. There was disappointment for the hundreds of athletes hoping to run in the Brighton 10k on Sunday as organisers were forced to call the event as Storm Angus hit the south coast on Saturday night. This left the Gosport Half Marathon as the sole major south-coast survivor of the weekend. Attracting more than 1,500 runners, the first select few dipped inside the 70-minute barrier despite the conditions as the remnants of the storm buffeted the athletes from all directions. Graham Woodward was Chichester’s first runner home in a creditable 126th place in 1.27.40. He was followed by Andrew Moore (403rd in 1.39 56), Ian Robertson (1.53 54), Sonsoles Acosta (2024th in 2.13.21), Margaret Enstone (1416th in 2.29.08), Richard Woolston (1442nd in 2.35.25) and Helen Wilkins (1480th 2.48.31).